The provinces of Surigao del Norte and Surigao del Sur in Eastern Mindanao, Philippines are extremely popular destinations for adventurers. It has been in my bucket list for a very long time and I have been meaning to tick it off. I still can’t tell for sure when I can pack my bags and go but I’ve already done my homework and compiled a list of all the wonderful tourist spots in Surigao. So now I’m sharing you what I have gathered so far as the most popular tourist spots in Surigao. If you’ve been to these places or if you’re planning on going anytime soon, please feel free to share your stories in the comment box below. 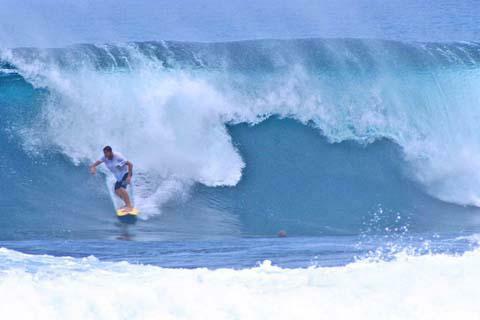 Who hasn’t heard of the majestic waves of Cloud 9 in Siargao? The island is famous among the world’s wave-riding circuits and Cloud 9 is arguably one of the most popular surfing spots there are. Not only is it at the top of the list of the most popular tourist spots in Surigao, I would even daresay it’s a top destination in the Philippines! Travelers who find themselves in Siargao are enamored by the island’s laid back atmosphere and bohemian lifestyle. Most accommodations and dining venues come cheap in the island but there are a number of more luxurious resorts opening as the island increases in popularity. Located just about an hour from Surigao City, Bucas Grande, also known as the Sohoton Cove National Park is a worthy day trip for extreme adventure seekers! I say extreme because the thought of swimming with jellyfish terrifies me and you’d be able to do exactly that here. Don’t worry; they’re the stingless kind of jellyfish so it’s not really dangerous. Sohoton Cave is most of the time submerged in water; visitors only get lucky and access the lagoon during low tide. Bucas Grande Islands has a unique ecosystem that fascinates even the most seasoned of nature lovers. Many locals have flocked to the little town of Hinatuan to experience the spell cast by the Enchanted River. Nestled in a mountainside surrounded a verdant jungle, the river is called enchanted not just because of its appearance but for its inexplicable quirks as well. For one, its water is deep blue and in a few places turquoise due to ocean water seeping through a crevice hundreds of feet below. 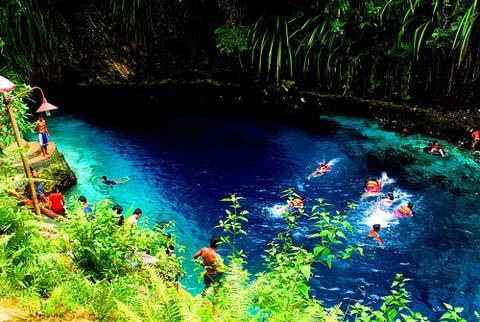 Considered one of the most popular tourist spots in Surigao and Mindanao, one can only expect plenty of visitors to the Enchanted River on any given day. No one is said to have fathomed its real depth which adds to the mystery. The river is also abundant with marine creatures. During certain hours, tourists are allowed to feed the fish but it is said that no one has ever caught a single one. And once you bathe in it, you’d feel as if you’d never want to get out of the water again. Enchanted is indeed a fitting description, isn’t it? 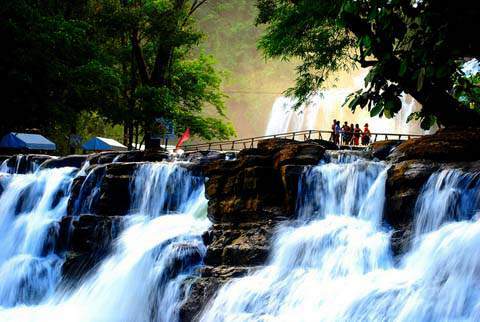 Coined as the Niagara of the Philippines, Tinuy-an Falls is a fast-growing tourist destination in the sleepy town of Bislig. This three-tiered waterfall is so majestic that those who have already been there always get lured back. Picnic huts and several concessions have found their way on to the boulders surrounding Tinuy-an Falls, something which a lot of travelers consider an eye sore and a detriment to the waterfall’s natural beauty. If you’d like to capture the majesty and wonder of Tinuy-an, ride a bamboo raft and go closer to its cascades. A lot of people say that the Britannia Group of Islands in Surigao del Sur are the region’s best kept secrets. Well, it’s not so secret anymore is it? There are 24 isles in all, scattered around the stunning Lianga Bay which faces the vastness of the Pacific Ocean. If the thought of seeing these islands does not create enough excitement for you, perhaps camping in one of them for a couple of nights would. Imagine this: sitting by a fire, eating barbecue and drinking whatever as the sea serenades you. That’s the most relaxing scene I can think of! Are you now as psyched to visit Surigao as I am? Let me know when you’re going, maybe we can meet up in one of the places I mentioned above. If you’ve been, tell us what you thought of it in the comments below. Cheers!